ConceptDraw DIAGRAM is a software for making well-disignecd infographic illustrations. The Spatial Infographics solution allows users visually present various map containing information. The library objects are scalable vector images that can be easily exported to PDF format, Microsoft PowerPoint, Microsoft Visio, graphic image file, or HTML. Sample 1. Design elements - Continent and country maps. Solution Spatial Infographics from ConceptDraw Solution Park extends ConceptDraw DIAGRAM ector diagramming and business graphics software with easy-to-use spatial infographics drawing tools. This solution contains spatial infographics samples, map templates to be filled in, and libraries of vector stencils for main design elements of spatial infographics. Use this solution to draw your own geospatial infographics documents with thematic maps, road maps, directional maps and transport maps. ConceptDraw DIAGRAM v12 diagramming and vector drawing software extended with Bar Graphs solution from the Graphs and Charts area of ConceptDraw Solution Park is ideal for drawing the Bar Charts fast and simply. Now anyone can build an infographics from their data using ConceptDraw. Nice and simple, but the features it have are power-packed! ConceptDraw DIAGRAM v12 is perfect for software designers and software developers who need to draw Computer and Network Diagrams. A continent is a large area of land washed by the seas. There are 7 continents on the Earth: Asia, Africa, North America, South America, Antarctica, Europe, and Australia. 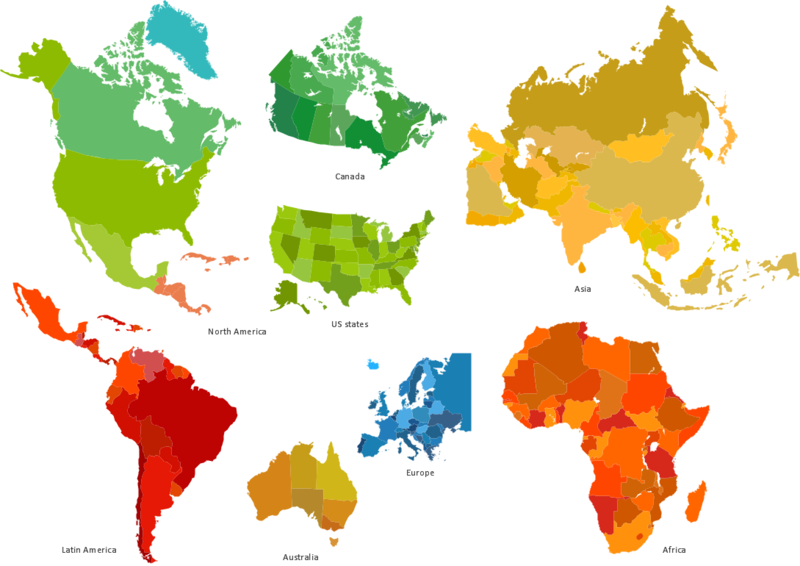 If you want create the 7 Continents Map, we offer you incredibly useful tool for this - ConceptDraw DIAGRAM v12 diagramming and vector drawing software extended with Continent Maps Solution from the Maps Area of ConceptDraw Solution Park. This sample was created in ConceptDraw DIAGRAM v12 diagramming and vector drawing software using the Business Process Diagram Solution from the Business Processes area of ConceptDraw Solution Park. The Business Process Solution is based on the standard BPMN 2.0 and includes the set of libraries of ready-to-use objects.